Is Arsenal the best place for Brek Shea? 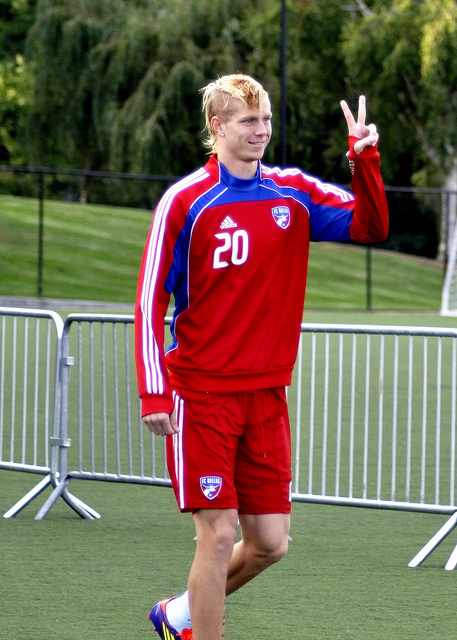 News that Brek Shea will join Arsenal on a two-week trial following the USMNT’s games in Europe against France and Slovenia is big news and clearly an indication that the FC Dallas left-winger is likely the next American to make the leap to Europe. But are the Gunners really the best landing spot for Shea? I don’t think so, and that’s not because of this blog’s general antipathy to Arsenal (Max is a Spurs fan after all). Shea needs to play in an environment that is conducive to his development, and Arsenal just doesn’t fit the bill right now. The lure of playing for one of the Premier League’s and Europe’s top clubs is obviously strong. And the Gunners are still in the Champions League and are climbing the table with four straight league wins after a rough start to the season. But you can’t shake the feeling that Arsenal’s restive supporters–having endured six straight seasons without a major trophy–are just a couple of bad games from returning to the mood of the early season when Wenger’s position seemed very much in doubt. That situation is exactly the opposite of what Shea needs. The nightmare scenario is that he gets thrown into to the squad in the middle of the season and has some early struggles, perhaps even missing a chance that costs the team two points, and the fans turn on him amid their souring on the team. When Oguchi Onyewu was thrown to the wolves at the heart of a terrible Newcastle defense in a similar January move, it cost him dearly and he had to return to Belgium his promise. Further complicating matters at Arsenal is that the gunners already have a player similar to Shea in Gervinho. The Ivory Coast international just arrived this summer on a $15 million deal and is now coming into his own as a regular starter and contributor during the Gunners resurgence. He’s tall, left footed, and can play either on the wing or as a central attacker. Now, Gervinho will miss significant time in January and perhaps into February for the African Cup of Nations, so Shea could get some games while Gervinho is out. But if Shea is only got to get regular action in January and then have to fight for playing time the rest of the season, that’s not good enough. Its hard to pick out a team in the Premier League that would be a good fit for Shea. This year’s Newcastle team looks like a solid and up and coming squad, but controversy just never seems far away with Mike Ashley in charge and again, that’s not the best environment. Shea has been linked with Fulham in the past, but they seem mired at the wrong end of the table and we know what that meant for Jozy Altidore at Hull. Villa would usually be the right kind of team, except they’ve got a terrible, negative manager in Alex McLiesh. Among the top tier teams, Liverpool might be the best fit, but there is a renewed tension around Melwood after a run of disappointing draws and it may be tough for Shea to get regular minutes. Maybe I’m worrying too much because it could all work out. At a certain point, the player has to take his chances and if Brek Shea really is going to be America’s first genuine soccer start, he’s going to have to succeed in tough enviroments. But if he’s going to go to one of the top tier sides in one of Europe’s top leagues, maybe Germany and Dortmund or Bremen would be a better fit than Arsenal. Disagree. I’ve thought Shea was a Wenger-type player ever since the 1st time I saw him. Whether he has the pace for the Premiership is something of an open question, but even if he had to drop back to defense – he would be the type of defender who ALWAYS gets the ball forward, and we know Wenger likes that. I’m a Gooner and thrilled to have him! Just wish he would stay!! Agree, that Arsenal isn’t the best spot for him — a mid-level team in a top league probably better — but his training stint seems to be genuinely a training stint and not a trail by all indications. So a move to Arsenal seems remote. Shea likely isn’t going anywhere this January or summer, for that matter. I doubt FC Dallas and MLS will want to sell their rising star quite yet — a few other MLSers will likely make the move across the pond first….